Disabled avast, and tried again. Alas, no dice. Once again though, two copies of that webpage popped up immediately after starting the launcher. I'll try starting it without internet to see if that works. i found another glitch, after i saved with a automatic way to make IVAN while i expanded i found the same contraption out in the no build zone??????? another glitch -.- i found a glitch where i can place boxes (empty) inside each other????? with my computer sometimes the display driver stops working but recovers after about 5 seconds, but when it does i have to restart my COMPUTER because my mouse is locked in an invisible game even clicking the windows button on the keyboard dosent help! (windows 10) even alt tab dosent work - HELP !!! Ensure you have at least 1,000 B. If not you cannot buy iron. Get more money by making Disk launcher out of sand. Sometimes, box unloaders will duplicate on top of themselves at random. I haven't found a pattern as to why, but I notice when a box unloads 2x as fast. Promoting to start a new factory while an inventory item (Pushers/printers) are placed will cause these items to be erased, but in the inventory screen it shows them as placed. This is particularly destructive to gameplay, as I have lost a 3D scanner and alt pusher from my inventory. Sound design - Sounds cut eachother off often, however if you forget to put an empty box for production, and try to sell multiple gym shorts at once, it causes an obnoxious loud "MY WHOLE FAMILY LOVES POTATOS COMRADE QUAKE IN FEAR" Fustercluck of noise. Not so much a bug, but something that could be improved. For example, when multi selling resources/weapons it should only play one sound. Heads up, next time you need something, go to the help page. Why does nobody notice it? i found a double boot glitch, someimes if i start up the game 2 instances of the game appears??? any solutions?? i do believe i found another glitch, lets say my volume (in game) is really low, i close the game then the next day i start up... FWOOM!!! sound is on max again???? are the little squares produced by the 3D Scanner deleted after a while? I am having a problem with my antivirus. It keeps telling me it is a virus as soon as i activate any feature of the application. From dowloading it to starting it up. I have already tried turning it off on download but no success. Im currently running windows 8.1 and the Panda free antivirus. Edited by BenderBomb, 24 August 2015 - 04:38 PM. I've found a minor visual issue when zooming very near to a conveyor belt. If I zoom very near and am looking at the conveyor belt and part of it is outside of the screen, all the items on them won't be shown. 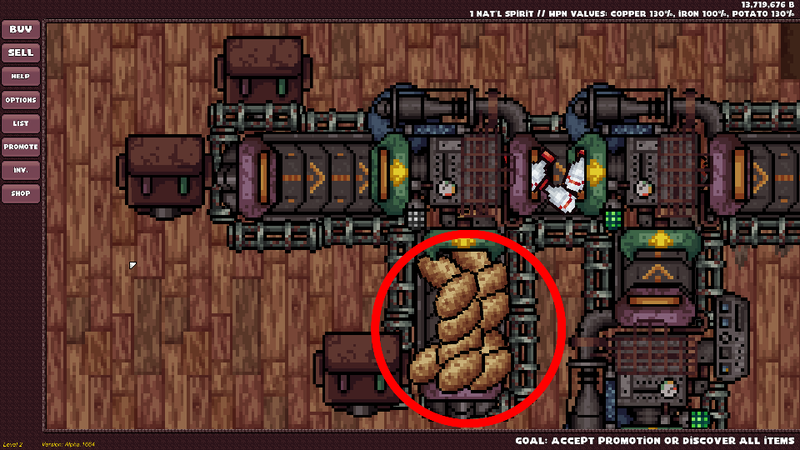 So all the potatoes which are on the unloader thingy can't be seen when the unloader is partially outside of the screen. I'm not sure if it's a bug but I'm quite sure it's unwanted. Um.... were you producing anything while you took the photo? Because that may had something to do with it. No, I didn't produce anything with the machine on the picture while taking it. And if you mean because the potatoes moved: There still was a load of potatoes at that position and both pictures together were taken in a timespan of around 2 seconds. Bug: National Spirit costs reset on the GUI. I did my first promotion, and proceeded to spend my national spirit on copper and iron. Upon saving and re-entering the game, I notice the costs displayed on the GUI had reset back to the starting values. I attempted to buy more price upgrades, but the action failed. It seems like only the GUI price got reset. Tested it with potato. Spent the national spirit, saved, quit, came back in and price was reset on the GUI. Can i have help. On mine it says : Proxy CONNECT abort what do i do? Please Tell me I cant play MOI Now! 3D scanner generates an item which ignores physics (does not stop motion once moving) and does not interact with anything. 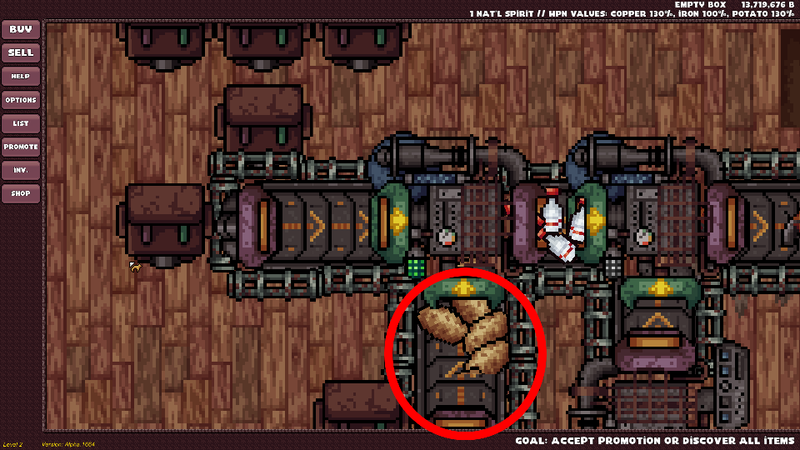 the animations of the conveyor belts and the loader/unloader sometimes become desynced. It does interact with the 3D printer! If that physicsless item hits the 3D printer, the 3D printer turns that physicsless item into the item it was before hitting the 3D scanner.